This Hawkeye camera range has two basic outlines: The 32 series has a spherical shape and uses a board camera with a ring of white LED's to provide lighting. The LED's are optically separated from the camera lens to eliminate blooming on the image. 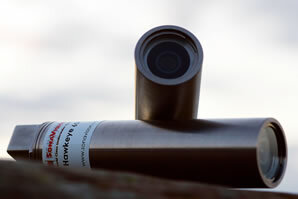 The other cameras in the Hawkeye range are based on a tubular design and can be provided with a wide range of camera modules ranging from moonlight sensitive black and white to high resolution, low light colour. There is also an option for fitting white LEDS for illumination when carrying out close inspection tasks. Provides operating and Iistallation instructions for the 32CS camera range.